Disclaimer: I was given a review copy of this DVD for the purpose of review. All opinions are my own. So we always make sure there is a few kid movies on hand to keep the busy as we play. Otherwise my uncles house gets turn into mess. I love my boys and little cousins, but man can they reek havoc! So last time we went up I took the all new Shaun The Sheep movie. They all feel in love! We had 3 movies that night, but we only ended up watching this one because they asked me to play it again. That night 8 little kids feel in love with Shaun the Sheep for the first time. From the company that brought you the Academy Award nominated film, Shaun the Sheep Movie (Best Animated Feature Film, 2015), the all-new TV special Shaun the Sheep: The Farmer’s Llamas will be available on DVD (plus Digital) and Digital HD on June 14 from Lionsgate. 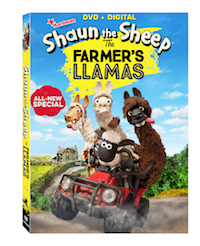 Full of Aardman’s signature high-energy slapstick comedy appealing to audiences of all ages, Shaun the Sheep: The Farmer’s Llamas DVD includes bonus episodes. When the Farmer and Bitzer go to a country fair, Shaun decides to tag along for the fun and finds himself crafting a brilliant plan to bring three exotic and witty llamas back home to Mossy Bottom Farm. Shaun is delighted with his new friends and believes that the llamas are just what the flock needs to spice up their lives. At first everything is fun, exciting, and silly, but soon their new llama roommates get a bit too wild in their new home.